A lot of girls growing up dream of being in magazines. Seventeen, Glamor, Elle, Vogue...those types of fashion/beauty magazines. I wanted to be in Town & Country magazine. My great-aunt was a subscriber to Town & Country. Every summer when I would visit, I would flip through her old copies and dream of being in the magazine. I loved the art, the homes, the travel, the clothes, the decor items, the parties... I loved reading about people and their charitable giving, what they were doing and how they were doing it. I loved how classy and elegant everything in the magazine was. When I was old enough to pay for my own magazine subscriptions, Town & Country was the magazine I subscribed too. I loved Pamela Fiori's version of the T&C and was sad to see her go. After she left, the new editor made too many drastic changes and took away the spirit of T&C, in my opinion. Jay Fielding became the editor and I love what he's done with the magazine. He brought T&C into the modern era, updating it to be relevant to today but when back to the true spirit and class of the T&C I grew up with. Anyway, that childhood dream of being in Town & Country? 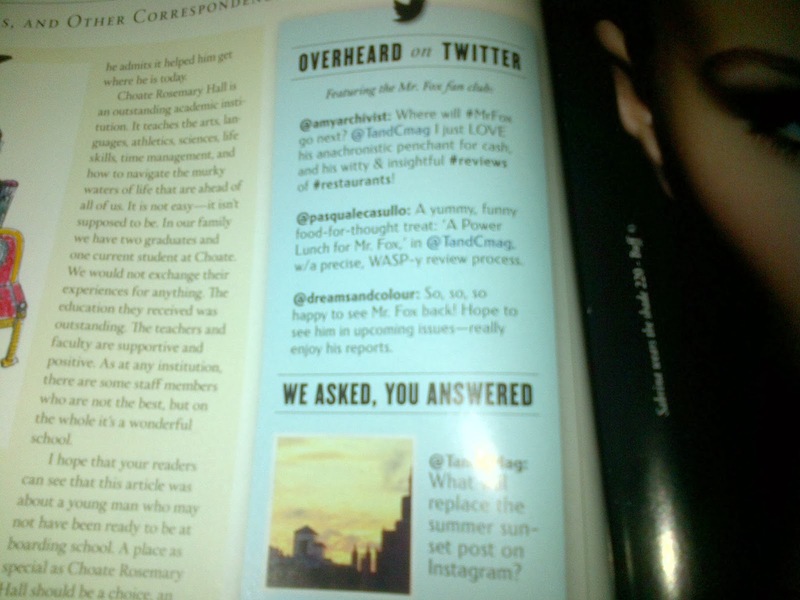 The last 'Overheard on Twitter' and right above 'We Asked, You Answered'...That's my tweet!!! In the November 2013 issue of Town & Country!!! I was a little behind in my magazine reading, so I just saw it a couple of weeks ago. I can't even describe my surprise and excitement at having my tweet published in T&C!! Thank you, thank you, thank you to whoever was in charge of picking the tweets to be published! As mentioned, being in T&C was a lifelong dream of mine. I've been kind of down about my upcoming birthday. Around this time of year, I was look back and evaluate my life; where am I, what am I doing, what have I accomplished? Seeing my tweet in T&C and realizing my dream of being in the magazine came true, was huge for me and made me feel a million times better about turning another year older. I accomplished something, a dream item, on my bucket list. I don't care what ANYONE says, having my tweet published in T&C totally counts as "Melissa being in T&C."